Storage is a major issue at most homes with little room for a lawnmower. Market leaders Masport and Briggs & Stratton have designed a concept to make storage easier and more efficient. Masport crafted exclusive handle system folds upright and then back on itself to create a sturdy base. Briggs & Stratton designed engine tips backwards up to 110 degrees without any fuel or oil leakage and is completely safe. 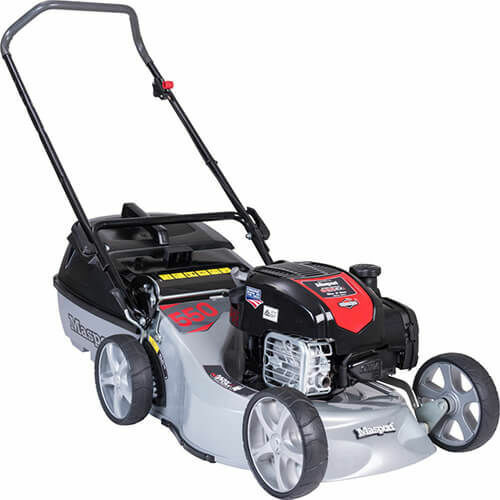 This combination gives us a complete mower package that is innovative, powerful and versatile! Mow the grass, Stow the mower - Save significant shed space! Mow & Stow Innovated technology that allows this engine to be tipped or stored upright without any leakage of fuel or oil.